BELIZE CITY, Mon. Sept. 5, 2016–After losing game 1 a week ago in the best-of-3 championship series to Infotel, defending champions Belize Bank Bulldogs rebounded this past weekend to take games 2 and 3 on Friday and Saturday nights, and emerge as 2016 champions of the Belize District Basketball Association (BDBA) Firms Tournament. Following the devastation of the Bird’s Isle basketball court by Hurricane Earl on August 3-4, all subsequent games in the BDBA Firms Tournament had been moved to the Belize Elementary School (BES) gym on Mercy Lane. In a high-scoring game 1 of the championship series on Saturday, August 27, Infotel had gained a close 99-97 victory over Belize Bank Bulldogs. But thereafter, the scoring was more restricted, as 80 points was enough for the Bulldogs to claim victory in both games 2 and 3 over the weekend. Game 2 on Friday night, September 2, saw Belize Bank Bulldogs winning by the same 2-point margin as they had lost in game 1, as they clipped Infotel, 80-78, to force a deciding game 3 for the championship. Leading the Bulldogs on Friday were Lincey Lopez 24 pts 4 rebs 5 assts, Duane Staine 19 pts 9 rebs, Brian White 13 pts 19 rebs, and Rupert Brown 12 pts 4 assts; while Infotel was led by Eyan Rene 24 pts 18 rebs 3 assts, Darwin Elijio 20 pts 3 asssts, Earl Johnson 11 pts 7 rebs, and Stafford Young 11 pts 7 rebs. 80 points was good enough for the Bulldogs again on Saturday night, as they held Infotel to 68 points for the 80-68 win in the decisive game 3 to take the championship. Top scorers for the Bulldogs were Brian White 25 pts 24 rebs, Duane Staine 15 pts 4 rebs, Rupert Brown 14 pts 5 assts; while for Infotel, Eyan Rene had 33 pts 9 rebs 5 assts, Earl Johnson 15 pts 8 rebs 4 assts, and Elton Anderson 9 pts 4 rebs. Following the championship final on Saturday night at the BES gym, team trophies and MVP trophies for regular season and the playoffs were presented. 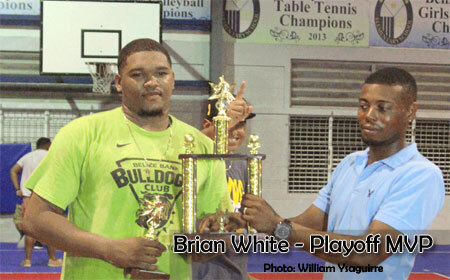 MVP Regular Season was Andrew Vasquez of Belize City Council Dragons; while the Finals MVP was Brian “Brybo” White of back-to-back champions Belize Bank Bulldogs.